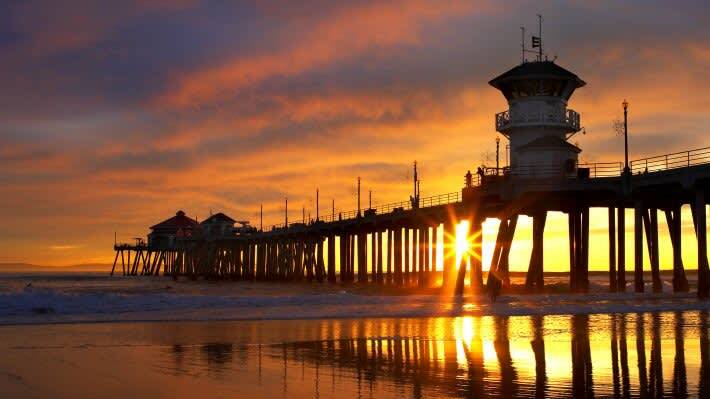 One of the advantages of Huntington Beach’s ten miles of uninterrupted coastline is the ability to appreciate the sunset in all its colorful glory from so many different locations. The best part is each spot provides a different atmosphere and has its own unique view. 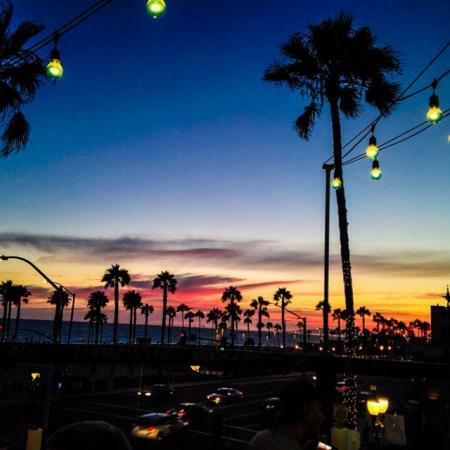 We’ve put together a list of the best places to cozy up and witness a Surf City sunset. Don’t worry though; it is beautiful no matter where you view it! It’s the classic sunset viewing spot, and rightfully so! The silhouette of the pier adds the right amount of depth to photos, and the lights adorning the walkway complement the sparkling ocean waves. 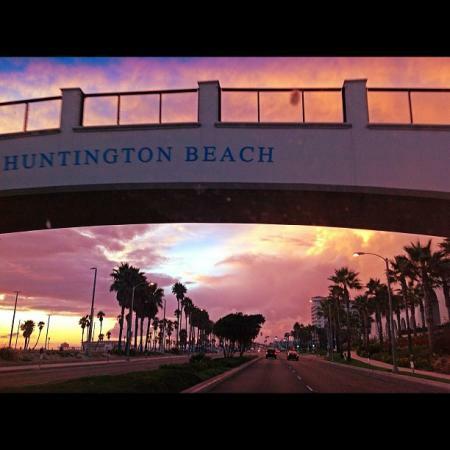 As you trek back to your hotel room, take a moment to turn and see the sun set behind the iconic Huntington Beach Bridge that crosses Pacific Coast Highway just south of Main Street. The palm trees lining the road set the perfect foreground for the sky’s warm gradients. You know what would turn a delicious dinner into a truly unforgettable experience? Getting a bird’s eye view of the sun setting over Huntington Beach as you enjoy a meal (and maybe a glass of wine) with your loved ones. From the balcony, you can see the sky stretch over the pier, PCH, and Main Street. 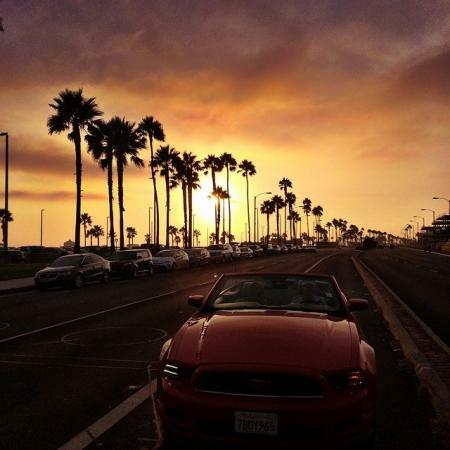 As you and your best friends are driving down California’s most famous highway and blasting your favorite music, top off the moment by taking a quick glance as the sun sets over Huntington Beach. Better yet, pull over to a nearby parking lot or meter for a few minutes to really enjoy it. With that kind of view, waiting at an intersection is actually kind of—dare I say it—enjoyable. Now THAT is a real SoCal moment! This spot is not as well known, but it is just as beautiful! 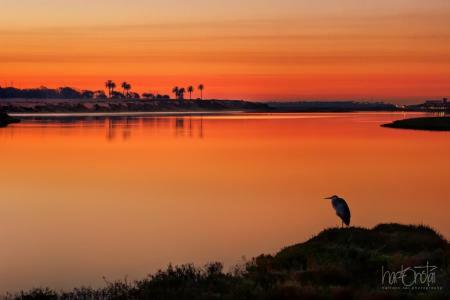 Bolsa Chica’s wetland waters are calm and soothing. When you look down at the ponds, they produce a perfect reflection of the orange and yellow hues above you. Unlike the busier parts of downtown, this location has an undeniably serene and natural atmosphere. If you’re having a lazy day or turning in early, you don’t even have to leave the room to experience a Surf City sunset. With an ocean view room at the Shorebreak Hotel or Hilton Waterfront Beach Resort, just pull up a chair and take it all in while rockin’ your pajamas and bunny slippers. Really, does it get any better than that? 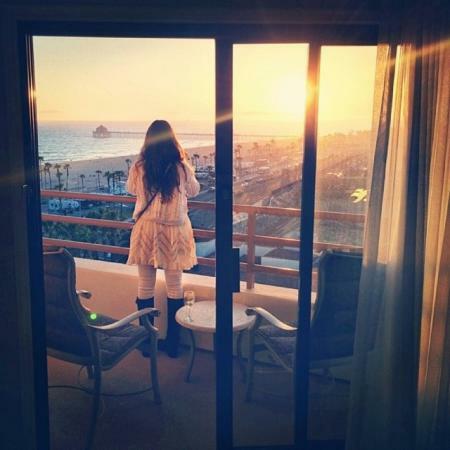 Why not try watching the sunset from a different spot each night during your Huntington Beach vacation? Guaranteed, the varying viewpoints will take your breath away every single time. 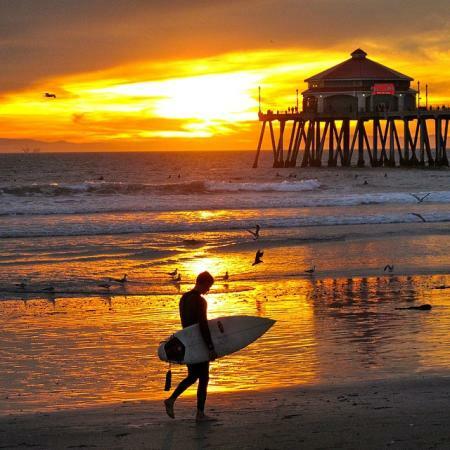 Let us know about your favorite Surf City Sunset spots by tagging your Instagram photos with #surfcityusa and #surfcitysunset. You could be featured on our social media!